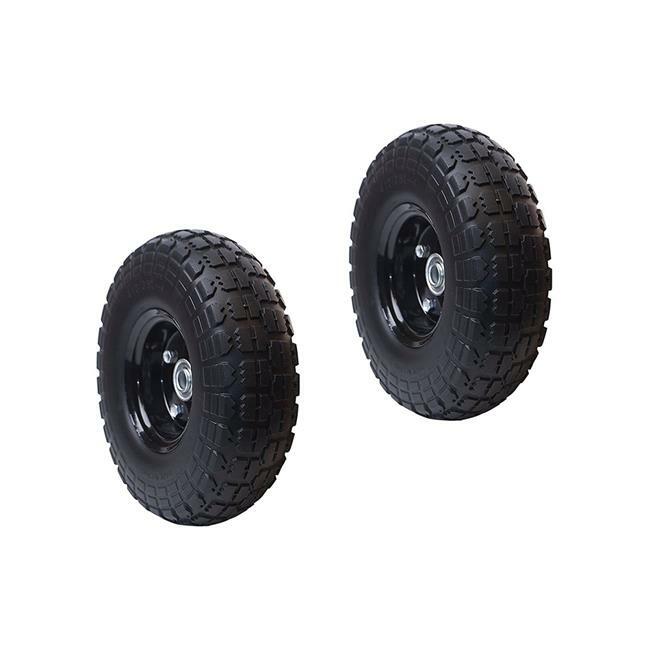 These are no flat 10 inch replacement tires for wheelbarrow. You will never again be stuck with a flat tire. These tires do not require air and feature a solid polyurethane design. It is made with .625 Inch bores. This is the ideal replacement wheel for wheelbarrows used on tough terrains. It has strong and durable tires, with a capacity of 300 pounds. The tire measures 10 inches in diameter and weighs 3.3 Pounds each. No flat tires have the same performance, cushion, bounce and feel as air filled tires. They are resistant to ozone and uv rays, and will not be affected by rough weather or tough terrain. Fits most wheelbarrows and other small garden and lawn equipment.